I have created a summary document, showing the different apps available to Office 365 Education users. Click the image for a larger version or you can download the Office 365 Education Essentials as a PDF – you can then edit it to your requirements in Word. Office Mix is a free add-in for PowerPoint that contains everything you need to easily create and share interactive online videos. You can include voice, video, digital ink, polling and interactive apps. I have spoken to lots of teachers who are using Office Mix to create presentations, videos and activities for their students. It is also a simple way to get started with the flipped classroom. 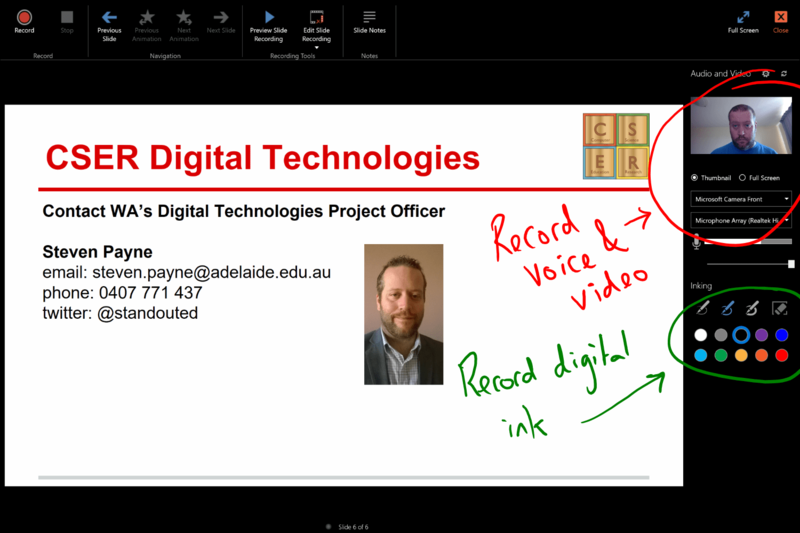 I often use Office Mix to support professional learning workshops. There is a great site for teachers full of tips, examples and scenarios: Office Mix for Teachers. However it is a great tool for students as well. Here are ten quick ideas for student use of Office Mix. Use a blank slide for mindmapping in group project work; record your conversations for evidence. Create a Mix TV ad to promote the book you are currently reading; use quizzes to get feedback from your peers. Create Mixes teaching local culture, history etc. for students in different countries (particularly where time zones make Skype a bit impractical). Record compositions or class singing and share with parents; include lyrics and animations so parents can join in karaoke style. Scan or photograph student work and record peer feedback. Create a Mix of a learning project or story; include videos, photos and scans or work, add a voiceover to tell your journey. Recreate a historic speech – use creative commons images and sound clips to enhance. Display the work and results of a science project from hypothesis to conclusion; include quizzes to collect peers and parents thoughts on the results. Create a virtual tour of the school for your school website – include quizzes to test new students and visitors . Collate the best slides from all your Mixes to create an end-of-term Mix and share with the rest of the school and parents.